I’m back from my talk on Babbage and his quest to build the first computer in the 19th century at NYU/Poly in Brooklyn. A great turnout–over 50–made up of computer scientists as well as members of the humanities and social science department (and, I think, a couple of Ada Lovelace fans from the local community). It was the first time the two departments had co-sponsored a talk, possibly the first time that the members of the two departments were even in the same room! I am so glad to have helped bring that about, especially given the book’s message about the need to bridge the ever-growing gap between the scientists and the humanists. Both groups seemed to love hearing about Babbage and his three friends! I spoke about how the meetings of the Philosophical Breakfast Club inspired and influenced Babbage’s project, and then about the workings of the engines themselves. A lively Q & A session ensued. I had a blast, and I appreciate the invitation and the fabulous audience. On Friday, April 29, I will be speaking to the computer scientists (and humanists) at NYU/Poly in Brooklyn about Babbage and his engines. Although not specifcally a talk about the book, it will address the revolution planned by Babbage, Herschel, Jones and Whewell at their philosophical breakfasts at Cambridge, because several key elements of this planned revolution came together in Charles Babbage’s decades-long quest to build the first computer: the need to highlight the value of precision in measurement and experiment, the initiation of public funding for science, and the directing of scientific innovation towards the common good. For more information, including an abstract of the talk, see this link. http://laurajsnyder.com/wp-content/uploads/2019/04/Laura-J.-Snyder.2074x340.png 0 0 Laura J. Snyder http://laurajsnyder.com/wp-content/uploads/2019/04/Laura-J.-Snyder.2074x340.png Laura J. Snyder2011-04-25 10:31:002011-04-25 10:31:00"Babbage and his Gem of all Machinery"
The video of my event at the New York Society Library on April 7th is now available on You Tube. The darkness of the video makes it difficult to see me, but the sound quality is good. 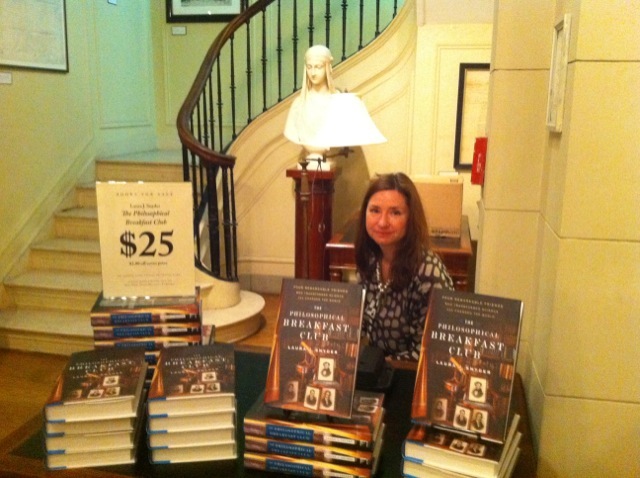 I had a wonderful time at the New York Society Library last night. The library, New York City’s oldest (founded in 1754), was a perfect setting for a discussion of the members of the Philosophical Breakfast Club and their time. During the Q & A, a lively discussion about the gap between science and the rest of culture ensued. Audience members agreed with me that scientists could, and should, do more today to bring their discoveries and excitement about science to the general public. It was a thrill to be invited to speak to a membership that has, in the past, included Washington Irving, J.J. Audubon, Herman Meliville, Willa Cather, Lillian Hellman, and W.H. Auden. Here are some photos from the event: books for sale, and the brochure for the event. Stay tuned for photos of my talk and possibly the video the library took. 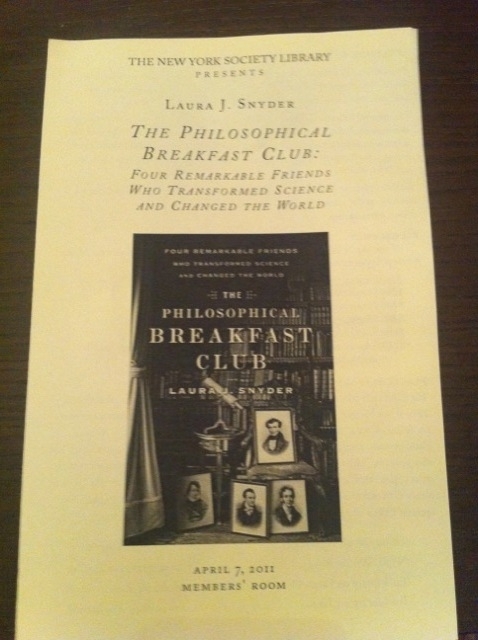 I will be talking about The Philosophical Breakfast Club, and signing copies, this Thursday at the New York Society Library (53 East 79th Street), at 6:30pm. I would love to meet fans of the book there! Tickets are available at the door, or in advance by contacting Sara at events@nysoclib.org. The library’s announcement is here. The event at the New York Society Library, originally scheduled for March 10th, has been postponed until April 7th. I’m sorry for the inconvenience! It’s publication day for The Philosophical Breakfast Club! If you have not yet ordered your copy, now’s the time! You can read it immediately on the Kindle, Nook or PC, or if you buy it from your local bookstore. I haven’t yet seen the book out in a shop. Leave a comment below when you have seen it in a window or on the shelves of a bookstore! Thank you! https://i0.wp.com/laurajsnyder.com/wp-content/uploads/2014/09/PBC.80x801.jpg?fit=80%2C80 80 80 Laura J. Snyder http://laurajsnyder.com/wp-content/uploads/2019/04/Laura-J.-Snyder.2074x340.png Laura J. Snyder2011-02-22 13:15:472014-12-15 19:53:01Publication Day!! On Monday at 9am EST I will be talking about The Philosophical Breakfast Club live by telephone with Sean Moncrieff of Newstalk Radio, broadcast out of Dublin. You can listen in here.